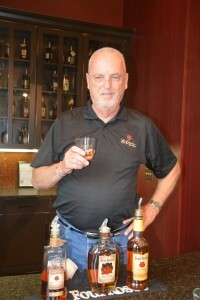 When Jim Rutledge announced last year that he would retire from Four Roses Distillery in September 2015 after almost 49 years in the business and nearly 21 as master distiller, somehow I couldn’t picture him as a retired guy, playing golf and puttering in the garden. Apparently he couldn’t picture it, either. On Thursday, he announced that he and two friend, Stephen Camisa and Jon Mowry, will build a “modern, highly efficient, environmentally friendly and sustainable distillery” near Louisville, Ky. The distillery will be called J.W. Rutledge Distillery. Camisa, who formerly worked at Sazerac, and Mowry, who has served in management roles at several wine companies, are now co-managing partners of Bedford & Grove LLC, a brand-building and sales and marketing company that worked with Kirin in 2006 to reintroduce Four Roses Bourbon in the United States after a 30-year absence. Among them, Rutledge, Camisa, and Mowry have more than 120 years of expertise in the distilled spirits industry. A 30-day crowd-funding campaign for the new distillery will begin on Monday, May 2, at Indiegogo.com. A link will also be posted on the J.W. Rutledge Distillery’s website. Good luck on your endeavor, what ever it may be Mr. Rutledge.